The second episode of Series Four was an adaptation of Death in the Clouds, first published in 1935. The novel was adapted for television by William Humble and directed by Stephen Whittaker. Humble reworks, transforms, edits and omits several passages from the novel. In fact, apart from the basic plot, most of the surrounding material is changed. I'll try to go through the changes one by one. First, Humble adds a series of scenes before the actual plane journey, set in Paris. These include a scene where Jane Grey and Poirot meet outside the Sacre Coeur, a scene at the hotel in which Poirot overhears a conversation between Lady Horbury and her maid, an entire tennis tournament (with Fred Perry, who was referred to in previous episodes like The Veiled Lady and Peril at End House) at Roland Garros attended by all the suspects and Poirot, several scenes that embellish the back stories of Lady Horbury, Venetia Kerr and Lord Horbury (who is present in Paris in the adaptation), a scene in which Poirot and Jane Grey visit a modern art gallery, and a scene in which Poirot observes Lady Horbury and Madame Giselle. These added scenes make complete sense, and some of them are referred to (but not outlined in detail) in the novel. The tennis match (in keeping with the producer's wish to include real-life events) is a nice substitute for the novel's casinoes in Le Pinet. Third, several of the remaining characters are somewhat changed. Jane Grey, who works as a hairdresser in London in the novel, becomes one of the two stewards (replacing the youngest steward) - a very sensible change, since it enables her to have a more active role in Poirot's later investigations. Also, Poirot does not attempt to match her with Jean Dupont as he does in the novel. Inspector Fournier, whose role is significantly reduced by the increased presence of Japp (who travels to Paris to investigate with Poirot), is portrayed as a somewhat more annoying police inspector than in the novel (at least in Japp's eyes), providing some gentle comic relief. Lord Horbury has a greater presence in the adaptation, too. 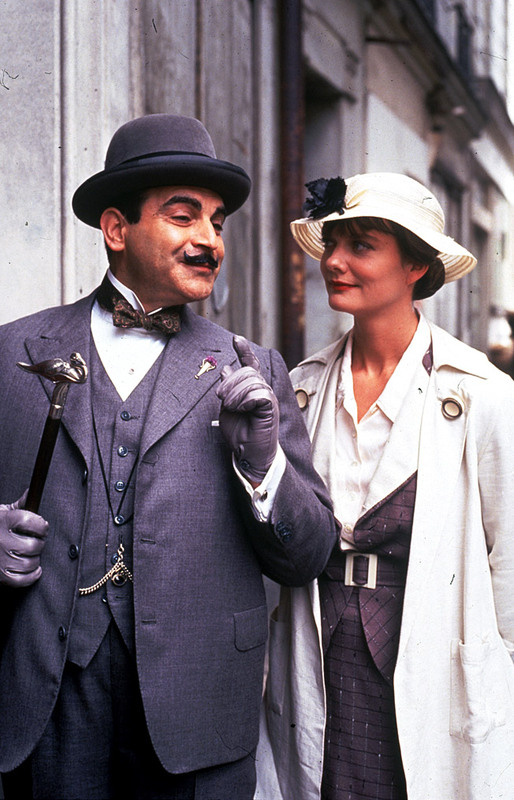 He is present in Paris and consults Poirot in London to explain that his wife isn't a murderer. His affair with Venetia Kerr (hinted at in the novel) is somewhat more obvious here. Also, Daniel Clancy is more eccentric in the adaptation, as he has conversations with his detective (sort of reminiscent of Ariadne Oliver in later episodes). Generally speaking, these character changes do not distract from the storyline. In fact, they seem to enhance it in some of these instances. Fourth, several passages are completely or partially deleted. Most importantly, the interviews with the various suspects are shortened down, and quite a lot of the discussion between the three investigators on the case (Poirot, Japp and Fournier), as well as Poirot's lists and reflections, are reduced. Chapters that are cut out include 'The Inquest', 'After the Inquest', 'Consultation' (but some of Madame Giselle's background is explained by Lady Horbury to Poirot), 'Probabilities' (Poirot's overview - but he checks them with the experiments on the plane), 'The List' (but the most important luggage, that of Norman Gale, is shown on screen as Japp examines it), 'The Little Black Book' (in fact, the entire issue of who could have been Giselle's "victims"), 'The American' (only parts of it are kept), 'At Antoine's' (not needed since Jane has become a stewardess), 'Plan of Campaign', 'At Muswell', 'In Queen Victoria Street' (the character has been deleted), 'Enter and Exit Mr. Robinson (Gale instead disguises as a journalist in Paris on Poirot's request), 'In Harley Street' (the character has been deleted), 'The Three Clues' and 'Jane Takes A New Job'. In sum, though, the deleted scenes aren't really that missed, unless you know the story by heart. I'm sure the main reason they were deleted was time constraints. Apart from the changes and additions outlined above, the adaptation stays fairly close to the original novel, keeping large sections of dialogue in the process. Subjectively speaking, I don't think it's a bad adaptation. In fact, I think it proves the point that a word-by-word adaptation isn't always the only acceptable solution - despite being significantly reworked, the adaptation still retains much of the spirit of its source material, and its changes make sense. Stephen Withttaker makes great use of the Paris locations. The opening sequence wonderfully sets the tone, with Poirot walking up the stairs to Sacre Ceur, and there are some lovely shots of the plane crossing the Channel. My only objection, perhaps, is that we get a few too many shots of the Eiffel Tower. I mean, we get the point, you are filming in Paris. There's no need to show us the landmark every other minute. (But that's a minor quibble, really). The production design is outstanding, and the recreation of 1930s aviation is impressive. The locations used for the episode include Palais de Tokyo, 13 Avenue President Wilson (the modern art gallery), Theatre des Champes-Elysees, 15 Avenue Montaigne (the hotel), Palais de la Porte Doree, 293 Avenue Dausmesnill (the town hall), Le Bourget Airport (the central 1930s section of the building), Shoreham Airport (Croydon Airport), "La Palette" cafe, 43 Rue de Seine (the meeting between Poirot and Lady Horbury). Cimetiere de Passy (the police station). Gunning's soundtrack was released on his first Poirot CD, but it is not included on the re-release. Thankfully, it's on YouTube. There's a lot of Poirot characteristics in this one. Notice, for instance, the collection of walking sticks and leather suitcases that he brings with him on the plane (they will all be seen in later episodes, even up to the most recent ones - an impressive sense of continuity in his wardrobe). Then, of course, there's his airsickness (delightful comedy acting from Suchet), his initial interest in Daniel Clancy's detective fiction (which will culminate in his magnum opus in Third Girl) and his gentle behaviour when talking to women in distress or out of touch with the setting they're in (like Jane Grey). Also, Japp gets some delightful scenes as he becomes a fish out of water in Paris (Christie never brought Japp abroad, but he goes abroad twice in the series, to Paris and Brussels (The Chocolate Box) - and possibly again for the upcoming adaptation of The Big Four. Of the guest actors, all manage to flesh out their characters in various ways. Of course, the two 'deputy investigators' Sarah Woodward (Jane Grey) and Shaun Scott (Norman Gale) do a nice job, but I'm actually quite intrigued by Cathryn Harrison (Lady Horbury), who gets to develop from an initial borderline stereotype to a somewhat more likable and fully fleshed character during the course of the investigation. One thing I never liked about this adaptation is the end, where Poirot says to one character that the killer "loved you." I much prefer the book's ending, where Poirot reminds the killer's love interest that he'd probably have killed her soon. Yes, I agree. I forgot to mention that point. The change gives him a redeeming quality which he probably shouldn't have had. At the same time, I'm sure the change was made because they felt the audience needed Jane to have a somewhat less tragic end scene. You were very sparing in your spoilers, so I will be as well. I haven't made it to the end, but the biggest problem I have with the TV adaptation is this. The set-up in the book (which doesn't waste time in Paris or with the 1935 French Open) makes the revelation of the killer jaw-dropping, and I don't think that if I could erase my knowledge of who the killer is and watch this episode, it will be that jaw-dropping. Another quibble I have is this. In the TV episode, they establish right away that Lady Hornbury is in debt to Madame Giselle. In the TV series, that isn't a spoiler. It is in the book, because it's hard-won information that Poirot eventually learns with the help of Jane Grey and Norman Gale. Also in the TV series, Lady Honbury and Venetia Kerr don't even pretend to like each other, while in the book Poirot actually gives up his seat so that these frenemies can sit next to each other on the plane. The book is an underrated masterpiece. I don't think this TV episode truly does it justice. I can't give away spoilers, but I don't think that what happens to Jane Grey at the end of the book is tragic. Sad, but probably exactly as sad as what happens at the end of the TV episode. What did you think abot the change in the ending, where they made a certain female character the accomplice of the murderer. She isn't in the book. I think, it makes sense, because she was a bit too naive in the book. Well, I agree that it makes sense. That's generally my approach to all the Poirot adaptations: I'm open to all changes as long as they make sense and work within that adaptation. Some of the changes even improve on the novels, others (like the entire "Appointment With Death") sadly don't. Another reason for the change might be to make Poirot look better. The character Anonynous refers to not only isn't an accomplice to the murderer, she becomes his second victim, but this takes place AFTER Poirot has stated that he's already figured out who the murderer is. I like the book, but other people have rightfully questioned why Poirot kept this information to himself because if Japp and Fourier knew earlier, her death could have been prevented. I haven't finished watching the TV episode, but after reading the book I am VERY disappointed with the changes. I'd talk further about WHY I'm so disappointed, but it would involve revealing bigger spoilers than Christopher did. Just out of curiosity---how big were commercial airlines in the 30's? That's an awfully small plane they use in the TV series, but in the book there are seats for 16 passengers in the REAR car of the "Prometheus" which means that the plane seated about 32. Was Dame Agatha making her own fictional airplane that didn't exist at the time? Also, in the book, Poirot claims the murderer could have disposed of the blowpipe throwing it away in a ventilation duct by the window. You'd have explosive decompression if you had anything like that in a modern aircraft, but if airplanes in the 30's flew at lower altitudes it might be possible. Did planes at the time have those ventilation ducts, or was that something made up for the book? In the TV movie, there was another cabin filled with more passengers. Actually, it was Japp who turned out to be annoying to me. I found his manner with Fournier almost insulting - appropriating the latter's office and so forth - and hamfisted. I would agree that Japp was annoying here, but I suppose the idea was to make fun of the 'fish out of water' thing, with him adjusting to the methods of the French police / French culture. Apparently this was Philip Jackson's favourite adaptation, mainly because of that contrast. Only a few of the changes worked for me: Daniel Clancy's craziness (which I loved, and was quite well-acted); the adding of an accomplice (which really does make sense); and making Lady Horbury more sympathetic (and actually, I do feel sympathy for her in the novel as well, just because when you take the times into account, women always seem worse off than men and to have fewer options.) Although, modern person that I am, I'd rather be an actress than an artistocrat, and after reading a few of these books, I start wishing I could tell people like Cicely that. And I'm not convinced that Stephen and Venetia's relationship was sexual in either version...I thought the point was supposed to be he was too old-fashioned for that, and if he has something sexual going with Venetia it really makes him no better than Cicely. First of all, I think Ryder and Bryant (the latter of whom, in the book, has a secret that might been relevant to Giselle) ARE missed - I think if you take away too many red herrings you take away too much suspense. I liked Poirot's relationship with Jane Grey but it overshadowed Jane's relationship with Gale, to the point that you almost feel like she's developing a crush a Poirot (it feels that way with a lot of young women whom he escorts and asks for assistance - other example is Pamela Lyle.) But here, it's almost a surprise that Jane turns out to care for Gale so much, because it's Poirot who has been occupying her time and attention. I was surprised by Poirot's love of surrealism...wouldn't he be deploring the lack of symmetry and order, even in art? I was even a little surprised by his comfort-level in Paris, given that he HATES to be mistaken for being French. Granted, that doesn't mean he hates France or French things, but it's important to him that people make that distinction. Here, it's as if, because he's Belgian, he's automatically comfortable in France, if that makes any sense. And both Fournier and Japp are annoying here...in the book Fournier is a "fuller" character and Poirot seems to respect him as much or more than he does Japp. (The book also has a callback to "Links" where Poirot slyly insults Gerraud.) But I don't think Fournier here was even well-acted as a comically not-so-bright inspector. He was just...flat. Many of the characters seemed flatter and blander here than either in the books or in other adaptations. I agree with Edward about Poirot's attempt to comfort Jane Grey at the end. We have talked a lot about his moralism in later series, but here, there should have been a stronger moral reaction from Poirot (if not about Giselle, than about the other murder). I agree that he almost comes across as helping to redeem the murderer (and how does he know that the murder's feelings for Jane were any more sincere than those for the accomplice he killed?) Also, Poirot mentions the killer aspiring to high society. By now, he should know enough to be able to say to people, "I have investigated many cases in high society circles...and I can tell you, the people moving there are not happy." Not that that would convince anyone, but that motive is even more of a reason for Poirot to be judgmental. The airsickness is in the books...but Poirot is not shown to be motion sick in Nile, Problem at Sea, or Bond Robbery in this series. So the "running joke" effect is somewhat lost by the time we get to this one. Re the deletion of suspects - the plane even LOOKS obviously empty. Of course, back then, flights didn't always fully "sell out" but, I don't know, it just looks incomplete somehow, and feels staged and too easy. The casino does still appear in the adaptation, after the tennis match. Lady Horbury is seen playing roulette before her visit to Madame Giselle, and again later in the episode. Not only is Poirot comfortable in Paris, but he makes a point of criticising the English and stating that tennis was invented by the French, almost as if he's identifying with the French. I've always thought it's unreasonable of Poirot to get annoyed with Japp for "this unforgivable slur" when actually Japp has made quite clear he'd never suspect him. The book makes much of "the psychological moment" (and in the adaptation it's Japp who introduces the idea! ), but really there isn't one. As Poirot says, there's a psychological REASON for no-one noticing (Gale disguises himself as a steward) but there's no particular psychological moment as such. Regarding the Japp/Fournier relationship, in fairness to Japp, Fournier gets things off to a bad start by being incompetent and neglecting to take contact details of an important suspect. Earlier, we see Fournier with his feet on his desk, reading his newspaper when admitting an unknown person to his office, so Japp seems justified in being unimpressed with him. There may also be an intent to recall The Adventure of the Cheap Flat, when Japp was on the receiving end of similar treatment. If Anne Giselle was brought up in Toronto, shouldn't she have a Canadian accent? Gale's plan is rather muddied. The wasp is released as a red herring. Then the dart, altered to look like a wasp, is left and so is the blowpipe. One fake murder method to mislead the police makes sense, but two seems counterproductive, especially when they are apparently designed to look like each other. Surely the most sensible plan would be to release the wasp and dispose of the dart. Even murderers are capable of falling in love. That did not give Japp the right to take over Fournier's office like he had every right to do so. Worse, the whole scenario is unrealistic, regardless of how "incompetent" the Parisian detective was. I guess the fact that her maid disappeared didn't affect Lady Horbury. Should it have? She must have disappeared if she got married and went on a honeymoon. Also, if she was a maid, would she have hobnobbed with the high society elite as is indicated in the film? Seems out of place and unrealistic.